PARKING: Parking for 8 to 10 cars can be found on Route 2. 3.5 miles East from the intersection with Route 16 South. 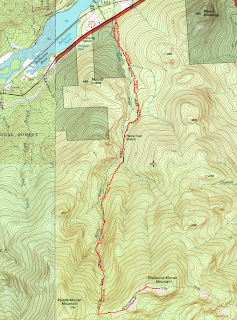 The Rattle River Trail is a 4.2 mile section of the Appalachian trail which travels from Maine to Georgia and is a wide and well trodden trail that begins on a light grade paralleling Rattle River to your right. The river offers several pit stop pools tempting me to dip my toes even in the cool crisp weather conditions. 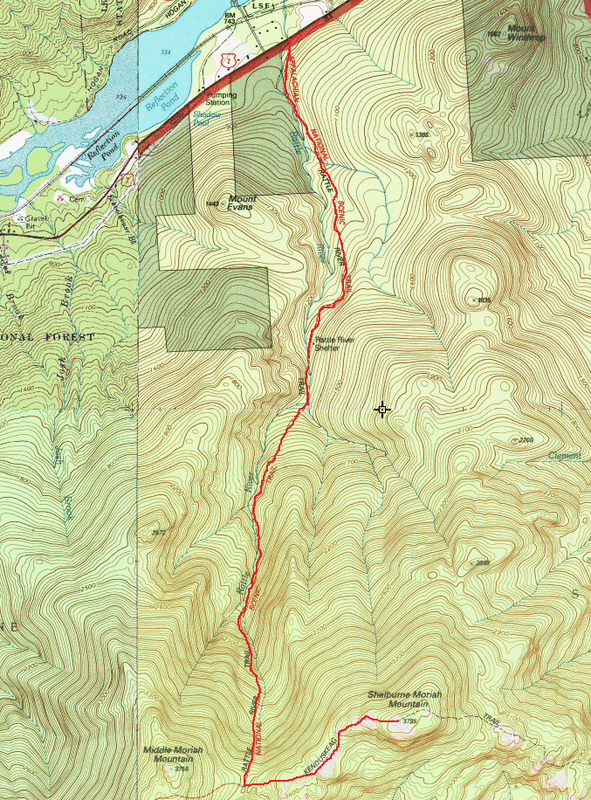 In a short distance you'll cross a tributary entering the Rattle River and continue along a light grade 1.6 miles to the Rattle River Shelter. The shelter is a typical AT shelter with trail names carved into the wooden walls, fire pit, tent platforms and an outhouse a short distance away. Continuing past the shelter the trail crosses then re-crosses the Rattle River before transitioning into a moderate rock step ascent. After approximately 1 mile the trail crosses Rattle River a final time and ascends steeply over rock steps. There were several sections requiring care where black ice covered some of the path. You reach a short section of footbridges leading into the col between Middle Moriah and Shelburne Moriah. Turn left onto the Kenduskeag Trail following additional foot bridges soon popping out onto an open rock face and you are presented with excellent views of the Carter Range and the rocky northern Presidentials in the background. The Kenduskeag trail is overgrown in several sections as it dips in and out of the tree line presenting better and better views before reaching a medium sized cairn at the summit of Shelburne Moriah. The summit is mostly open and offers spectacular views in nearly all directions. A 100 foot spur path leads to a rocky outcrop with excellent views to the east and south. Overall the trail was a bit muddy in the lower sections and contained a few blowdowns to avoid however was well maintained and easy to navigate to the ridge. All river crossings can be navigated with strategic rock hopping. The Kenduskeag trail was overgrown and in need of maintenance but easy to follow to the Shelburne Moriah Summit. Mt. Shelburne Moriah is a little peak with a big punch. At 3735 feet it is not tall enough to qualify on the primary lists of 4000 footers and is shy of making the New England 100 highest list however, it does qualify for the New Hampshire 100 highest at #64. Shelburne Moriah is ranked #5 on the NH 52 With A View list and #69 on the YMCA alpine Club list. Regardless of list, it is a worthy peak to visit and it's expansive panoramic views will not disappoint.